The classic backless shoe, adorned with intricate gold beading at Oscar de la Renta, slick stripes at Fendi and golden brocade at Rochas. 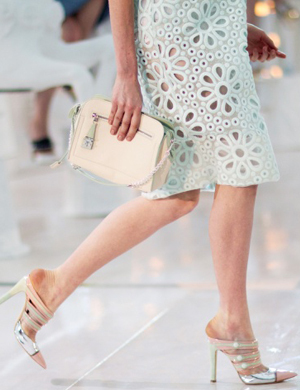 Louis Vuitton matched its candy pastel collection to pointed mules with metallic straps and silver toes. Stand on a small step (with railing to help with balance if needed) with your toes towards the back edge. Balance on one leg and perform a set of calf raises, lowering yourself below the step and then pushing up onto your toes as high as you can. Repeat slowly for two mins or until you fatigue, then swap legs.